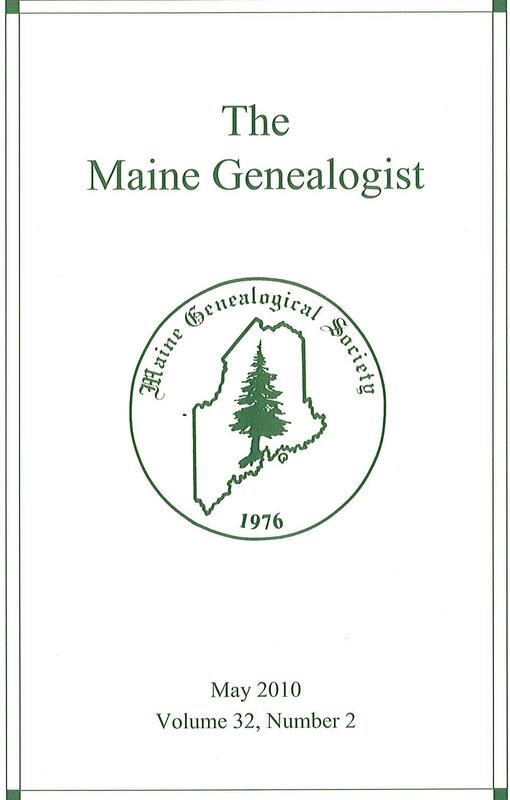 The Maine Genealogist is the quarterly publication of the Maine Genealogical Society. For more information, please visit us on the web at http://maineroots.org/special-publications/. Also included in this issue is the complete index to Volume 31. Joseph Crook Anderson II was honored for his contributions to MGS at the Annual Conference held in Bangor, Maine, on September 26, 2009, being presented with the inaugural Clayton Rand Adams Memorial Award. MGS was honored to have Clayton’s widow, Nancy, and his daughter, Sarah, join us for the introduction of this award and the announcement of its first recipient. The August issue of The Maine Genealogist is now in circulation. Four of the articles in this and the prior issue have something remarkable in common – the identification of children born to unmarried parents. Illegitimacy in Colonial times was treated as a moral and financial problem. Early church records frequently document confessions of the sin of “fornication” or admonitions against persons having illegitimate children. For example, in 1790 the elders of the Second Church of Berwick felt it their duty to express to Susanna Hamilton their “abhorrence of her conduct as evil by suspending her from their communion & from all special privileges of the same.” The John Knight deed shows that the Massachusetts town fathers were more concerned about the support of the illegitimate children, and they took legal steps against the parents to ensure the children would not become town charges. As genealogists facing perplexing lineage problems, we should be aware that children born to unmarried parents was a fairly common event. Though it is often difficult to prove an illegitimacy, when proof is available it will most often be found in original church, town and court records. The Maine Genealogist is published quarterly. For more information, visit our website at http://maineroots.org/special-publications/. The May issue of The Maine Genealogist is hitting our members’ mailboxes now. Deciding when to publish can be a difficult decision for genealogists. We may have uncovered a wealth of valuable information on the family under inquiry, but are reluctant to release it to others while unanswered questions remain. Or we may think there is always more research to do and we don’t want to risk publishing incomplete or erroneous information. The problem, of course, is waiting too long. Publishing our work should not necessarily be viewed as the last stop in the research process. If we are stuck on a problem or if we have made an error in our conclusions, making our research available to others may turn out to be the conduit for locating persons with the solution to the problem. Several of the articles in this issue demonstrate how that process may occur. The November issue of The Maine Genealogist is hot of the press and should be in the mailbox of all our members. “This issue of The Maine Genealogist proves once again that some of the most valuable genealogical information does not come from standard sources. Censuses and vital records are the basic building blocks of genealogy, but they rarely tell us anything about the quality of life or personalities of the people we are investigating. If we want to learn what it was like to walk in our ancestors’ shoes, we need to find records that provide insight into the personal challenges and circumstances that our ancestors faced. “Nathan Barlow is familiar to all Maine schoolchildren as one of the Liberty Men who resisted the Great Proprietors in the early nineteenth century, but little else has been written about him. Author O’Flaherty has compiled a detailed account of Nathan’s life and family, with some of the most illuminating facts being gleaned from unusual sources including: an eyewitness account written by a neighbor describing a particularly defining moment in Nathan’s life, a criminal case heard by the Kennebec County Supreme Judicial Court, and the records of the Charlestown [Mass.] State Prison. She has woven the information into a story of a life marked by zealotry, financial difficulties, misdeeds, and ultimately tragedy. “Authors Smith and Battick describe their frustration in tracking Emily Woodman, who seemed to have disappeared from the records shortly after her marriage. The eventual discovery of a divorce petition provided many of the facts they were seeking and offered the added benefit of a firsthand account of the suffering Emily endured in her marriage. Additional research uncovered a three-generation cycle of early marriage and divorce in Emily’s family, with the divorce records offering poignant details of these people’s lives not found anywhere else. So what’s the total lineup for the August 2008 issue of The Maine Genealogist? UPDATE: The article previously linked to from this page is no longer available on the Bangor Daily News web site. Roxanne wrote her final Family Ties column for the paper on January 30, 2016. MGS friend Roxanne Moore Saucier is very well known to those of us in Maine who subscribe to the Bangor Daily News. Her Family Ties column has been a mainstay for many years. For those afar, you can keep in touch with Roxanne by following her columns at the newspaper’s website: http://www.bangornews.com/. Her 02 June 2008 column, “Genealogy journal has perspective on ancestors,” discusses the content of the current issue of The Maine Genealogist, our quarterly journal. We recommend bookmarking Roxanne – her weekly column appears every Monday! What interesting articles can be found in this quarter’s issue? Samuel Cates of Falmouth and Harrington, Maine: A Review of Current Knowledge and Discussion of His Parentage By Brent M. Owen, Wilfred A. Cote, and Frank C. Morrone. The Parentage of Young Booker of Bowdoin and Gardiner, Maine By Priscilla Blount. Jacob Waldron Swett Bible Record Contributed by Leslie Dow Sanders, along with a genealogical summary of the Jacob Waldron Swett family of Georgetown and Arrowsic, Maine. Portland, Maine, Marriage Intentions, Volume 4, 1814-1837, Copied by Joseph C. Anderson, II, FASG. The Maine Genealogical Society is pleased to present this first issue for 2008 of The Maine Genealogist. Although it has undergone a number of name and editorial changes over the years, the Society has now published its genealogical journal for thirty years – a major milestone for a small society. In this issue we offer a variety of material, including new compiled studies of two Maine families, a valuable Bible record, the first installment of a series transcribing the early Portland marriage intentions, and reviews of recent publications. Readers familiar with the famous diary of Martha Ballard will be interested to learn about Martha’s brother-in-law, Dr. Stephen Barton, a medical doctor who practiced his profession in Vassalboro at the same time that Martha was midwifing in Hallowell. Dr. Barton’s account book provides an illuminating glimpse into the practices of a country doctor in the latter part of the eighteenth century. It is also noteworthy that Dr. Barton has the distinction of being the grandfather of nurse Clara Barton, the founder of the American Red Cross. And those of us familiar with common Maine surnames may not recognize Lincolnlue as one of those. In his article, author Nasman shows that the three Lincolnlue sisters of Bowdoin were the progenitors of at least 120 descendants in the first two generations alone. The Maine Genealogist is published quarterly. For more information, visit our website at www.rootsweb.com/~megs.